If you are a fan of using Busterjerk and Bandit glide baits, you have probably heard of the Strikepro Bandit Shad! This particulary softbait is a great tool for fishing the deeper layers of a water system, in which you cannot get down to where the Big fish live with the two mentioned jerkbaits above. It has the exact same profile, and is equipped with a paddle tail, which creates an amazing rolling action in the water, that will drive any Pike or Muskie wild for sure! Nowadays fishing with soft plastic baits is a hot item in the Esox world. 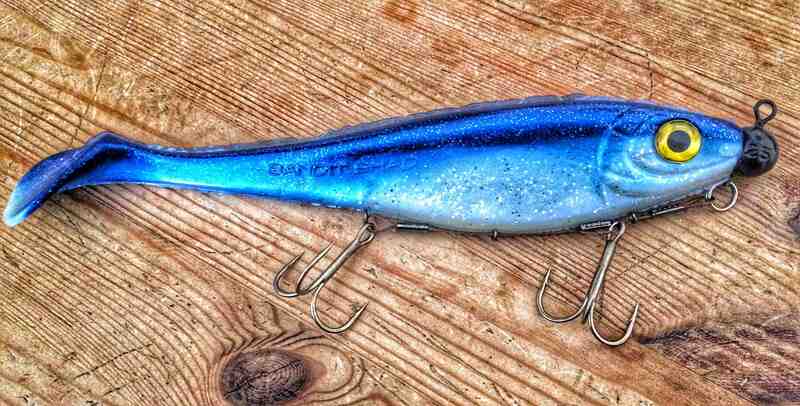 The development of softbaits for both Muskie and Pike have taken a huge lift in the last couple of years, and the Bandit Shad is a great example of such a bait. 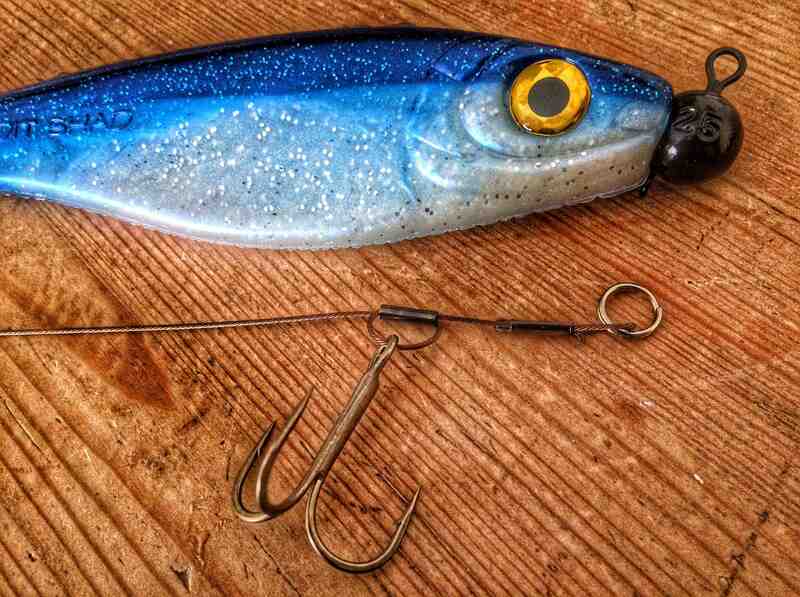 It comes unrigged in a single pack, and there are many ways to set one up for fishing. You can either choose to use a shallow screw, to make it run shallow, or use a BFT Flexhead Pike to make it run in all kind of different layers of the water. There are a wide variety of weights to choose from, but the one I like best and the one that I’ve used in this Step By Step guide is the 25 grams version. The Bandit Shad has a large body profile, that needs some weight to get it down. With a heavier head you’ll be able to fish it in any desired layer of the water. Whether it be deep or shallow, this will do the job just fine! 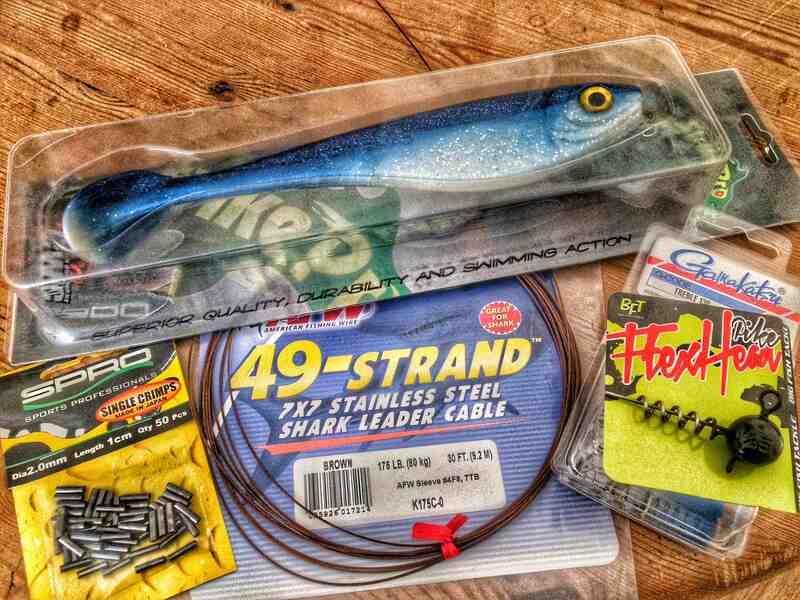 So what do you need to rig a Bandit Shad? Well, as you might know there are pre-rigged systems on the market that you can buy, and put underneath the softbait immediately. I like to make my own, and for the following reason: most pre-rigged stingers are made of titanium, and however I used that in the past as well, I now converted to using 175lb 49-Strand Shark Leader Cable from American Fishing Wire. As you might know this is the wire material I also use as a leader, so why not use it as a stinger? It’s amazingly flexible and more important, it will stay straight no matter what. So it doen’t matter how much fish you catch on this rig, it will last, and is very easy to handle and work with, so you can make a perfect rig just the way you want it! I use 2.0mm sleeves from Spro, but any other brand will do just fine. Assuming you already have some knowledge of how the basics work, below is explained how to set things up. If you hold the Bandit Shad upside down, you’ll notice it has a fairly wide body. 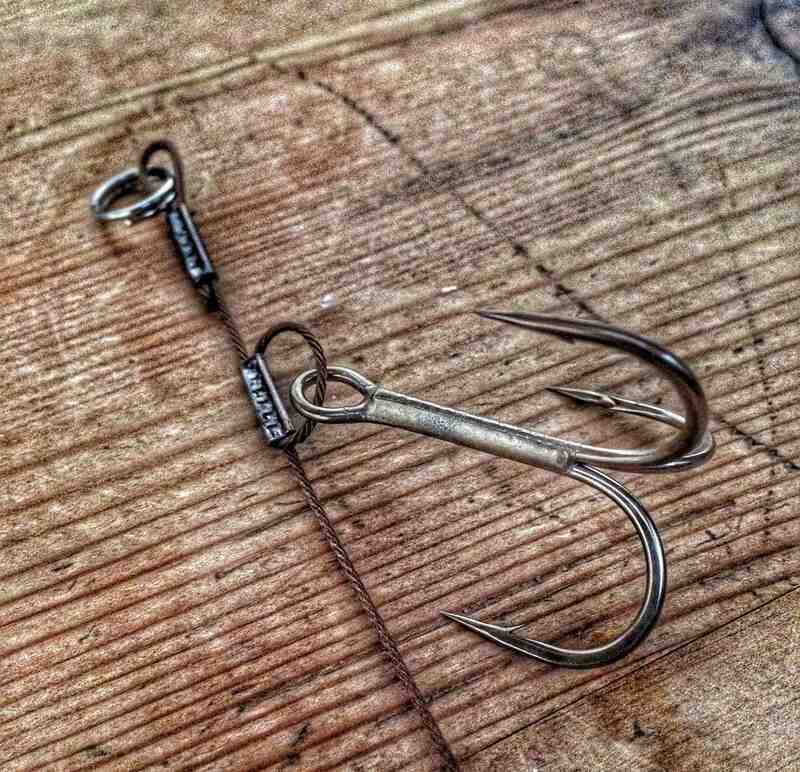 In order to increase the hooking percentage to it’s maximum, razorsharp 2/0 trebles are used by Gamakatsu (Treble 13B). The reason why I use such big trebles is simple. The bottom of the shad may look thin, but on top it’s fairly wide, and this way things are perfectly alingned to one and other. You can choose to use smaller trebles, but I like them to be a big as possible, so you will never miss a fish. Start by putting a splitring on the wire and then pulling the 175lb 49-Strand Shark Leader Cable 3 times through the sleeve. This way you have a secure fit, and you can attach the splitring to the lower eye of the BFT Flexhead Pike. Crimp it and you’ll have finished the first step! Measure where you want the first treble to be set. The second step is where you want to put the first treble. Doing this right is very important, because 99% of the Muskie or Pike will attack your bait head first, so you need to place it strategically! There are many ways to do this, but the one pictured above is the most simple and also most effective way. Simply put a sleeve onto the leader wire, and then put a 2/0 treble in the loop. Finish of the loop by putting it back into the sleeve. This way you can move the treble up and down the wire as you like, and position it to be perfect the way you want it to be. As you can see, the treble is placed with the welded hook down. This way when you fish it through the water, the other 2 hooks will sit against the body of the softbait. Again, to increase the maximum hooking percentage! If you are statisfied how the treble sits in it’s position, just simply crimp it in place. A close-up of the first loop eye with the 2/0 Gamakatsu Treble 13B on. Now one thing that lasts is step 3 of putting the rear treble in place. You can choose to use a smaller treble because the back of the Bandit Shad is slightly thinner than upfront, but I like to use two that are identical. Just a personal preference. When placing the rear treble you’ll need to be carefull not to place it too far back. This way you will keep the most action in the shad for better catching results. Also you have to bear in mind that the two trebles should not hook into eachother. You can easily prevent this by making sure the eye of the rear hook is positioned some where under the letter S printed on the back of the shad. What I like to do, is now placing the treble in a way that the welded hook faces upwards, so you can stick it into the soft plastic body if needed. Aditionally you can finish of the stinger by putting 3 spikes onto the 49-Strand, and then push them into the softplastic to hold the whole system in place. This way the stinger will immediately pop out when you get in contact with a fish. It’s an easy step by step, but one that is highly effective and can be made very fast. You can even choose to make one on the water. It’s that simple. Below you can see what the finished product looks like! The rig complete. A perfect stinger for the Bandit Shad!